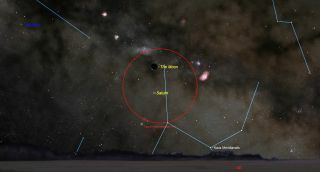 Look to the southeast horizon before sunrise on Feb. 11 to see Saturn directly below the crescent moon. Should local weather conditions permit, check out the southeast sky about an hour before sunrise on Sunday morning (Feb. 11). There, you will find a slender crescent moon, 17 percent illuminated, and hovering directly below it will be a bright "star" shining sedately with a yellowish-white hue. But that's no star. It's a planet: the famed "ringed wonder," Saturn. Saturn's rings, of course, are not visible with unaided eyes; you will need a telescope magnifying to at least 30 power to bring the features into view. As I have said on other occasions here at Space.com, Saturn is the one object that even the most veteran of stargazers never get tired of seeing. I have patiently stood on lines at star parties over the years waiting to look at Saturn through large telescopes and listening as each person took their first look through the eyepiece, followed by exclamations such as, "Oh my God!" and "That's incredible!" or simply, "Wow!" Indeed, if you are fortunate enough to catch a glimpse of Saturn through a moderate-size, 6-inch (15 centimeters) telescope at 150 power, the view is striking. Through a 10-inch (25 cm) instrument at 250 power, Saturn is simply gorgeous. And if you ever have an opportunity to examine the planet with a truly large instrument, like a 16-inch (41 cm) telescope at 400 power, Saturn is a sight that will literally take your breath away. Right now, the northern half of the rings are tilted 26 degrees toward Earth. This means they're so wide that the front of the rings hides the lower part of Saturn's disk, while the back of the rings protrudes partway out from behind the upper limb of Saturn. Saturn, imaged by the Hubble Space Telescope. Saturn is currently located in the constellation Sagittarius, almost directly above the star that marks the top of the lid of the asterism popularly known as "the Teapot." But while Saturn is always a "must-see" object for skywatchers with telescopes, there is also a drawback for prospective Saturn observers currently. For those in midnorthern latitudes, at around 40-degrees north, Saturn will be at a relatively low altitude even when it reaches its highest point in the southern sky. From now through the year 2020, Saturn will never get higher than 30 degrees above the horizon. (Read more about how to measure distances in the night sky.) And atmospheric instability tends to adversely influence sky objects located lower than 30 degrees above the horizon. Coming this summer: A "planet trifecta"
Now, here is some good news: Saturn will be part of a spectacular "planetary summer trifecta" in 2018. The ringed planet will be flanked to its west by brilliant Jupiter and to its east by Mars — which will be making its closest approach to Earth in 15 years late in July. So, we will have all three planets in perfect position to observe during convenient evening hours in July and August. So, enjoy the very pleasing celestial tableau of the crescent moon and Saturn early Sunday morning, and keep this in mind: The best views are yet to come!